Well folks, it's been nearly a year now since I've taken the time to show this blog some love. Note: It's been a helluva year. LOL. An explanation will come in upcoming posts. 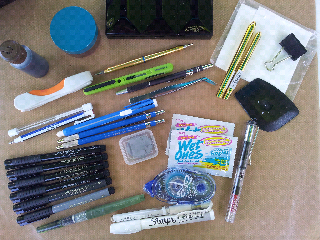 For now I'd like to ease back in on a totally positive note and share with you my current art kit. How do you find time to journal? The easiest answer is I'm always ready because my journaling "ingredients " are always with me. How do you decide what type/method of journaling is YOUR style? I simply do what I enjoy. While I might try out some of the recent trends I always go back to what makes me happy. It's why I journal in the first place. How do you decide which is the right journal for you? Trial and error for a while. Then I began to ask myself a series of questions based on what I wanted from my journaling experience. I eventually ignored all the 'experts' and settled on what worked for me. More on this later. The first photo is my complete setup packed and ready. The small black Saddleback Leather clutch holds all my supplies. It measures approximately 7x5x2 inches. Plenty small enough to fit in my purse. My journal is refillable-a must for me. I love the leather but do not want to pay the price for a bound book each time I need a new journal. This one is by Renaissance Art. Called an A5 plus due to the fact that they've added a few more sheets of paper in each refill than their other books. The paper they use is Arches woven text, heavy enough to take my watercolors and anything else I might throw at it, great with my favorite fountain pen, all around perfect for me! The text block slips out so if I want to get really messy there is no worry about damaging the cover. Once I've filled the book I simply slide it out, label it and slip in another. Again, perfect for me. My watercolor box is by Winsor & Newton. Holds 24 half pans which I have filled with Daniel Smith tube watercolors-they're my favorite. I find I don't really need 24 colors and plan to downsize soon. But this has been a wonderful palette for me for quite some time now. The next photo is my kit. I find this kit to work so well that even while at home I rarely need much else for journaling. The occasional decorative tape, scrap of paper or rubber stamp for fun but all the basics are with me all the time. The ingredients are: top center, my watercolor box, moving clockwise as much as possible...a paper towel in a tiny Ziploc bag, two Escoda travel brushes sizes 6 & 2, a bulldog clip, a Ranger scraper thingy, my Lamy Safari fountain pen filled with Noodler's Bulletproof black ink, individual wet wipes, a glue tape runner, Signo Uniball white pen, a Sharpie poster paint white pen, a waterbrush filled with the same Noodler's ink as above, a set of four Pitt markers in black with different nib sizes, two Pitt pens in gray shades with brush nibs-for shading, a kneaded eraser in a SD card box, two Staedtler lead holders, one with soft lead the other hard, a Staedtler click eraser for large areas, a Tombow Mono Zero eraser for tiny spots, tweezers,& a click razor knife, a KUM Pencut compact scissors, a Logan Graphics embossing stylus with four interchangeable ends, a portable folding toothbrush, a bottle of walnut ink and a water jar. This is, after much trial and error, the schtuff that makes journaling a perfect fit for me no matter where I might wind up. I hope this is of some interest or help to some. This is the box closed and the mat is for scale. At left is the box opened as is. At right is said box with cutting mat, waxed paper & bag containing sandpaper, napkin & scraper removed. Up close of the two sides. 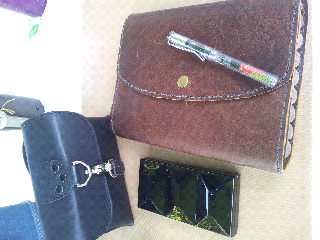 The container is a Vaultz pencil box, approx. 8.25 x 5 x 2.75 inches. It even has a tiny key! With a bit of room to spare for ephemera I might pick up along the path...believe it or not, lol. The Bijoux box is perfect because of its small size. There is a travel brush in the tin also which is handy. The right photo shows the embossing stylus. It unscrews at the center blue thingy where two more tips are stored. Handy for embossing, debossing, scratching & manipulating/distressing paper. This particular Colour Shaper is sold for use with masking fluid but can be utilized in a number of different ways. This is called the Perfect Pencil by Faber Castell. The top as you can see on the right comes apart to reveal a sharpener. Having the cap keeps the graphite from getting all over. I have enjoyed this tool. The Fiskars fingertip razor knife along with a cutting mat is better for me because I have severe numbness in my hands frequently and seem to be able to manage to do the intricate work I prefer easier with this tool than with typical scissors. And lastly, everyone needs one of these. This is a nephew. (Overlook the swollen left eye. Not all models come with this flaw. This particular nephew has older brothers and one of them blackened his eye the night before while wrestling.) Our little Jaime graduated from preschool a couple of days ago and is hanging out with his Aunt Mikey until his regular sitter is also out of school for the summer. We had a grand time taking these photos and discussing in depth what all that "junk in that box" is for. I hope this is helpful. In one of the Yahoo! groups that I am a member of some of us are participating in a monthly journal swap with a partner. Above you can see some of the entries I have shared in both of our journals. The group is Blissfully Art Journaling and my partners' name is Stacy. This has got to be one of the most delightful groups of people I have ever had the pleasure to be associated with and Stacy is absolutely the best journal partner ever!!! Circumstances have kept me from joining in the discussions on the board recently, but I faithfully read every post and learn so much from the precious souls who are there. It is a caring community of like-minded individuals, (where art journals are concerned at least), who make a concerted effort to lift one another up. I like that. The photos below are from a tip-in swap also done monthly on the same group. I have ceased to participate for the time being due to overwhelming family obligations but plan to get right back at it as soon as possible. The art I have received from others has been fantastic. Out of respect for their privacy I will not share their creations here. You'll have to be satisfied with the schtuff I've come up with, lol. I hope you have enjoyed perusing my blog. It has been my pleasure to share with you a while. Bright and early yesterday morning I was sitting in my studio, checking my email, when a movement to my right made me stop and pay attention. I was absolutely thrilled to realize that I had visitors. Three beautiful deer were contentedly munching grass in our side yard. Thankfully I had my camera close by and got a few photos. I just had to share them. These gorgeous creatures touch my heart with their graceful and elegant movements. I felt so blessed to witness their interaction for just a little while. After a long few moments something spooked the trio and I thought it was me until I realized our 'yard dog', Willa had been sleeping right beneath my window and had just taken notice of the deer. The photos below make clear what became of my nature viewing at that point. It was a most serene moment while it lasted. By the way, Willa is quite harmless, she simply finds pleasure in making a fuss about strangers of any sort. Obviously she did not make much of an impression on my new found friends because two of them showed up again this afternoon. This pair is a momma doe with her fawn. She is quite large for a female and the most amazing thing to watch. I am planning to get them some feed to put out to help them along. We can make sure they are not shot at while here with us but there are no guarantees once they leave our property so I plan to try to keep them close. I hope you enjoyed them as much as I did. Sending love to y'all. I have been attempting to scale back my crafting 'things' due to the crowded nature of my studio. When my Grandaddy moved in with us last year I gave up the larger space on his behalf and some of this schtuff has just got to find a home with a bit more space. Luckily for some dear soul I am forced to release a number of great items at terrific prices. If you see something you are interested in just email me at jinxiegoforth@yahoo.com. All these items have been lovingly used and treasured. This item is the Clip It Up! by Simply Renee'. All the extra clips, tags/dividers and such are included, many were never used. There is also a cover that was never used. This thing holds a huge amount of stuff! Retail is approximately $100.00. I am requesting $25.00 plus actual shipping. This is the Tag-A-Long by Ellison. I do not recall what we paid but I am requesting $10.00 plus actual shipping. This is the Revolution by Quickutz. It is currently on sale @ our local Hobby Lobby for $99.00. I am asking $40.00 plus actual shipping. If you have any questions, (or would like to make me an offer, or have something you would like to trade or barter with) - just ask. I have sold numerous items on Ebay with 100% positive feedback. My username is jinxiegoforth. I have simply become disenchanted with all the fees and issues related to Ebay recently. Say you are short on money right now, and who isn't? I am willing to trade these items for items I can use that have an equivalent value or part cash and part trade. Email me - I bet we can strike up a deal. Some things I can always use include but are not limited to: Watercolor Paints and Accessories, Journals - Moleskine Large or Pocket w/Lined Paper or Moleskine Large w/Watercolor Paper or Handbound w/Watercolor Paper, Fountain Pens, 140 lb. Cold Press Watercolor Paper, Handmade Items, Your Unique Art, Unique Actual Ephemera and Olde Stuff in general, etc. This is one of the major reasons for my obvious lack in the blogging department...I returned to the work force in February of this year and it took quite some time for Wayne and I to adjust. Of course there has been many other things taking place during that time that have demanded my attention but this one has been a "biggie". Considering the fact that this job should be quite simple, and it technically is, personalities and corporate decisions seem to keep this little place in turmoil. Truly, I enjoy this job but remain confused by how some manage to complicate matters seemingly without cause. All nonsense aside, I am practically in heaven being surrounded by books all day long and people who appreciate them too. Certainly all employees do not share my passion but some do and many customers are just great. For the most part, when there is not some silliness going on internally, I really enjoy the interaction and atmosphere. For now I am 'giving it a go' having to cut my hours to a minimum due to the illness of a beloved family member. BUT I thought some of you who make an effort to keep track of my whereabouts might be interested to know where all my free time has gone. A few weeks ago we were delighted to receive into the Goforth fold six new family members. Just wanted to share a photo of the cuties before they find new homes. Isn't this just too adorable?! Hello World, Christian, wife & mother & new Grammy - that's just a few of my titles. I love & am devoted to God, my husband, child & grandchildren completely. My extended family is also a large part of who I am, (including our pets), I love them, too. On another level I am a bibliophile, budding writer, truth-seeker, gardener, art journaler & paper manipulator. In a perfect world, (with a constant temperature of approximately 80 degrees), I would be able to pursue my interests out of doors in the sunshine all the time! Without fear of contradiction I refer to myself as a country girl. City life does not suit me at all. I need space, sun, green & growing things, animals, freedom, flowers, etc. (You get the idea?). Simplicity is important in my day-to-day affairs. I do not function optimally under the constraints of society today. (It depresses me to think we have been reduced to beings who feel the need judge our fellow humans by the clothes they wear or the vehicle they drive. How distressingly sad.) My soul needs to give & receive love, love, love. Here, for your perusal, is a peek into my heart. My first real 2009 post! Mikel Ann. Theme images by UteHil. Powered by Blogger.